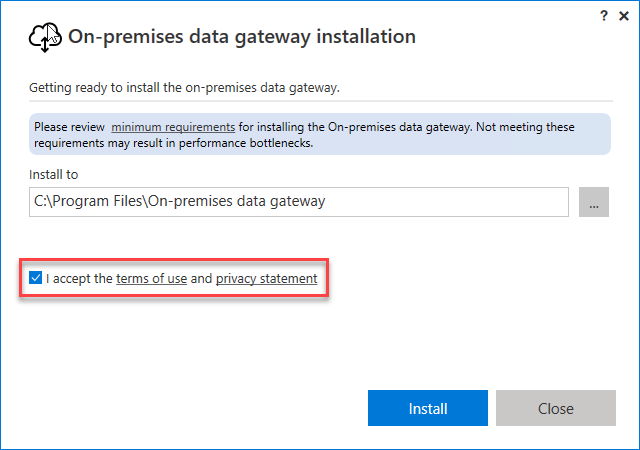 An on-premises data gateway is required when one or more Azure Analysis Services servers in the same region connect to on-premises data sources. To learn more about the gateway, see On-premises data gateway. During setup, when registering your gateway with Azure, the default region for your subscription is selected. You can choose a different region. If you have servers in more than one region, you must install a gateway for each region. The gateway cannot be installed on a domain controller. Only one gateway can be installed on a single computer. Install the gateway on a computer that remains on and does not go to sleep. Do not install the gateway on a computer wirelessly connected to your network. Performance can be diminished. When installing the gateway, the user account you're signed in to your computer with must have Log on as service privileges. When install is complete, the On-premises data gateway service uses the NT SERVICE\PBIEgwService account to log on as a service. A different account can be specified during setup or in Services after setup is complete. Ensure Group Policy settings allow both the account you're signed in with when installing and the service account you choose have Log on as service privileges. 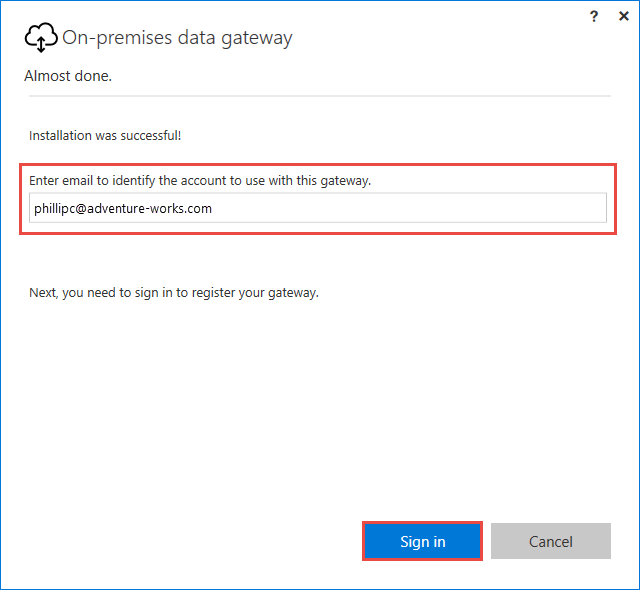 Sign in to Azure with an account in Azure AD for the same tenant as the subscription you are registering the gateway in. Azure B2B (guest) accounts are not supported when installing and registering a gateway. If data sources are on an Azure Virtual Network (VNet), you must configure the AlwaysUseGateway server property. The (unified) gateway described here is not supported in Azure Germany regions. Instead, use Dedicated On-premises gateway for Azure Analysis Services, installed from your server's Quick Start in the portal. Select a location, accept the terms, and then click Install. Sign in to Azure. The account must be in your tenant's Azure Active Directory. This account is used for the gateway administrator. Azure B2B (guest) accounts are not supported when installing and registering the gateway. If you sign in with a domain account, it's mapped to your organizational account in Azure AD. Your organizational account is used as the gateway administrator. 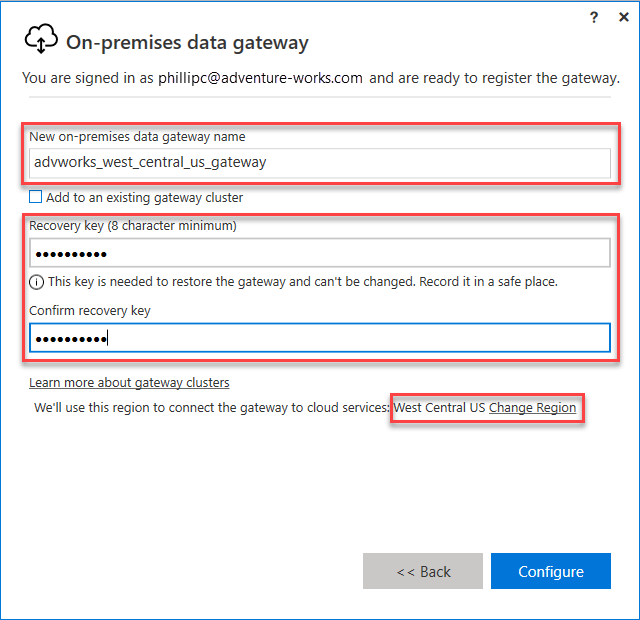 In order to create a gateway resource in Azure, you must register the local instance you installed with the Gateway Cloud Service. Select Register a new gateway on this computer. Type a name and recovery key for your gateway. By default, the gateway uses your subscription's default region. If you need to select a different region, select Change Region. Save your recovery key in a safe place. The recovery key is required in-order to takeover, migrate, or restore a gateway. After you've installed and registered your gateway, you need to create a gateway resource in your Azure subscription. 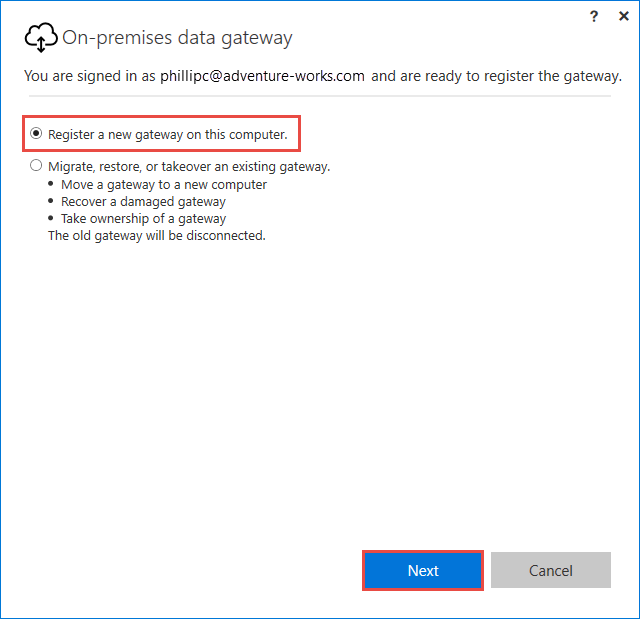 Sign in to Azure with the same account you used when registering the gateway. In Azure portal, click Create a resource > Integration > On-premises data gateway. Name: Enter a name for your gateway resource. Subscription: Select the Azure subscription to associate with your gateway resource. The default subscription is based on the Azure account that you used to sign in. Resource group: Create a resource group or select an existing resource group. Location: Select the region you registered your gateway in. Installation Name: If your gateway installation isn't already selected, select the gateway registered. In your Azure Analysis Services server overview, click On-Premises Data Gateway. In Pick an On-Premises Data Gateway to connect, select your gateway resource, and then click Connect selected gateway. If your gateway does not appear in the list, your server is likely not in the same region as the region you specified when registering the gateway. That's it. If you need to open ports or do any troubleshooting, be sure to check out On-premises data gateway.